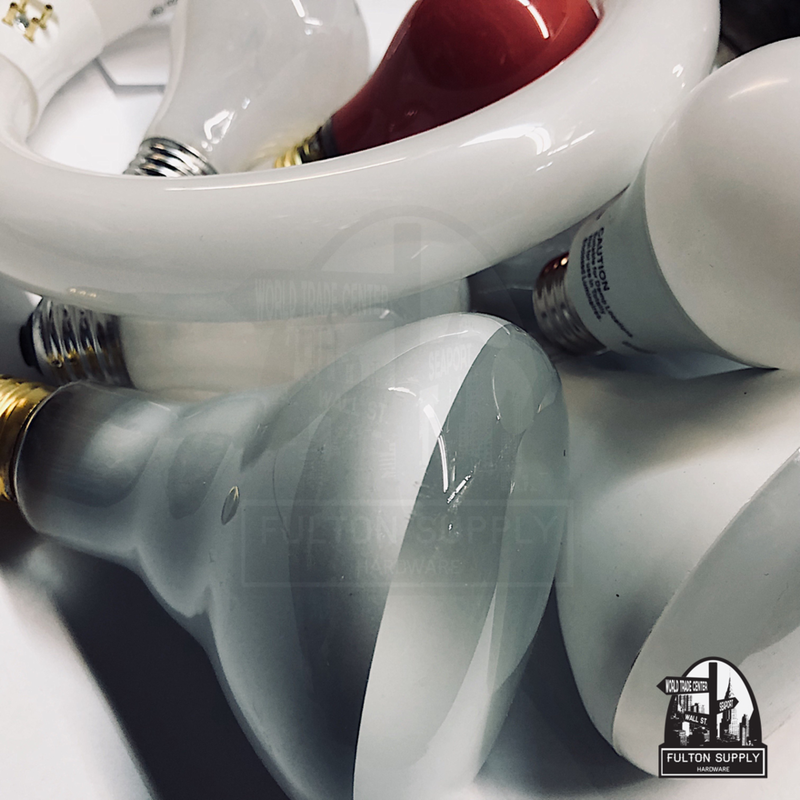 Fulton Supply carries the largest selection of light bulbs in Lower Manhattan, with over 3,000 types of bulbs. From hard-to-find incandescent bulbs, halogen, CFL, and LED’s in white, color, and backlight to shades and blinds, we have your lighting issues covered. With Sheetrock, Plywood, Masonite and various 2×3’s, 2×4’s, and fine pine 1×2’s through 1×12’s, plus supply metal studs, corner beads, sand mix, dash patch, plaster, Rocite cement, and more, Fulton Supply is your one-stop shop for all hardware needs. Fulton Supply is the top option for all lock-related needs, with Schlage, Omnia, Medeco Arrow, Marks, Valli Valli, Best, Yale, Von Duprin, Corbin Russwin, and Sargent locks. We can special order any lock or cylinder, and also carry and install proximity readers, code locks, access control systems, electric strikes, magnetic locks, and door closers. With a full selection of EMT pipes and fittings, outdoor and indoor boxes, plates, outlets, switches, dimmers, romex cables, ballasts, and more, all of your electrical needs can be met at Fulton Supply. We also carry breakers, including federal pacific replacement breakers, and a large selection of buss fuses, time delays, and glass fuses. 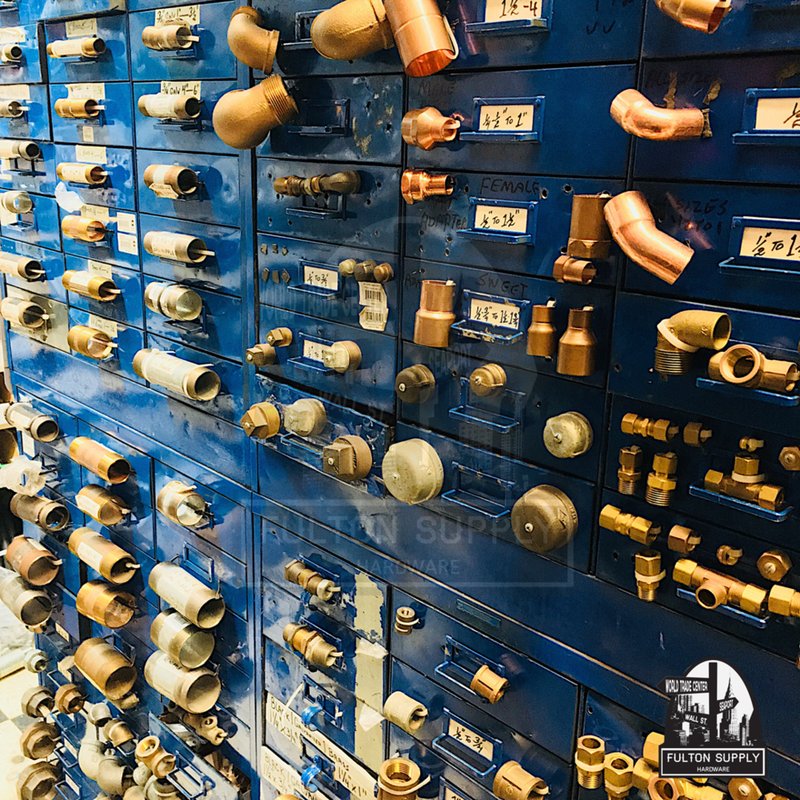 We have a wide array of copper, black, galvanized, and brass fittings from 1/8” through 2”, along with compression fittings and hoses. We can cut and thread pipes from 1/2”-2”, and we carry all sink and dishwasher hookup parts. Tough to find toilet brands? Fulton Supply has them all in stock, including American Standard, Kholer, Toto, Krowne, T&S, and repair kits and flushometers for Delta, Sloan, and more. We also carry restaurant plumbing supplies, faucet parts, and anything else you might need. Fulton Supply carries a full line of California Paints (formerly Muralo Paint) and other brands, available in a wide range of styles and colors. Instead of spending time and money on advertising, California Paints ensures that resources are spent in the lab on new products and color matching. We can also color match any brand and even “read” your color with our state-of-the-art paint matching computer. If a company tells you their colors can’t be matched, come to Fulton Supply and see them proven wrong. Fulton Supply has one of the largest selections of screws in metric and standard, along with larger and unusual sizes. We have coarse thread, fine thread, stainless steel, and brass in any size you need. Grade 5 and 8 bolts in large sizes up to 1" are also available. As the ultimate destination for construction and renovation needs, Fulton Supply stocks picture hooks, pins, and hangers from 5-100lbs. in different varieties, including OOK and those as seen on TV. We also carry aides to make your picture hanging process easier.